Brooklyn snuck up on me. It started as a very nice immigrant-to-America type of story but then built into something much better and more exciting! By the end I couldn’t put it down (me + reading chair + Brooklyn = a weekend’s entertainment). The story starts in Ireland and follows Eilis, a young Irish woman, through her immigration to and first year in Brooklyn. The historical context is interesting – it takes place just after WWII, and feels impressively authentic. 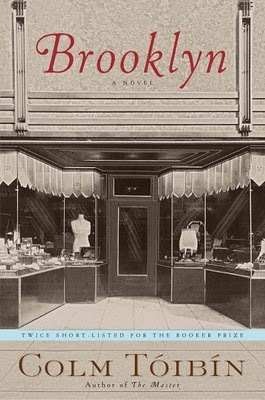 Tóibín addresses the nuances of racism in 1950s Brooklyn, and the issues faced by workers struggling in a difficult economy. The narrative is surprisingly powerful – in many ways it is a coming-of-age story. Though she’s young (late teens, I think), Eilis has to make important life decisions about where she will live and what job she will take when she is suddenly faced with complete independence. She deals with homesickness and heartbreak and a death in her family. Like the book itself, Eilis’ character evolves and strengthens through the novel. Colm Tóibín is an Irish literary star and Brookyn is his sixth novel. I was surprised by the slightly controversial turn Brooklyn took, but apparently that's normal in Tóibín's works. "His novels have been noted for their deft characterizations, particularly of women, as evidenced by the strong female protagonist in The South," noted Contemporary Literary Criticism, but it wasn't until later novels such as The Story of the Night and The Blackwater Lightship that readers would realize his insight into gay characters as well” (source). I definitely want to read his other books, and highly recommend Brooklyn for your reading list!